As the car wound its way up the two-mile serpentine hill, I smiled to myself, daydreaming about how I would feel when, within minutes, I would be the first in my family in nearly 100 years to breathe the air, walk the narrow streets, and step inside the churches of my great-great-grandfather’s village in Calabria, the toe of Italy’s boot. Although the logic of avoiding motion sickness told me to focus straight ahead, I couldn’t. 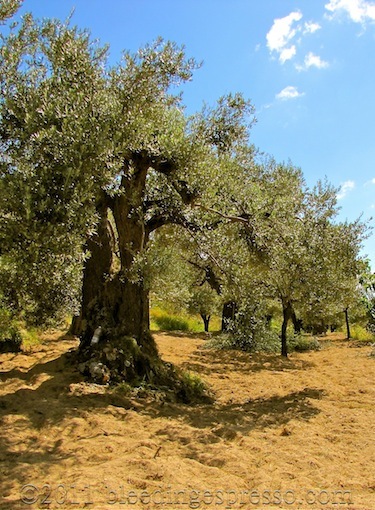 I was mesmerized by the groves upon groves of olive trees lining the hillside in perfect rows, their leaves glistening so brightly I could’ve mistaken them for being covered in snow if it weren’t June. Some of those trees simply had to have been there when Papù made his way down the hill that last time toward his ship of destiny in Naples; many of the thick, gnarled trunks easily showed a century or more. Now I could feel the trees watching me, and I imagined that their shimmering dance in the breeze was the olive tree version of smiling. And I smiled right back. Whenever everything and everyone seem to be smiling upon me, I know I’m on the right path. My stomach flipped and flopped around each bend, but it was worth every bit of queasiness to arrive at that random “S” curve halfway up the hill when suddenly, literally out of thin air, it appeared: Badolato and its ancient stone houses clustered together one on top of the next, in support or conspiracy or both, precariously perched on a hill, anchored by a church in the center – just as it had been for a millennium. Is it possible for your heart to leap with joy and simultaneously sink with heaviness for everything you didn’t even know you were missing just moments ago? Mine did. And then it did again when I stepped out of the car in the piazza and felt a century’s worth of lost time collapse into a single heartbeat. Quite simply, I was home. I know that sounds trite and probably unbelievable, but just as people describe love with the phrase “You just know,” I just knew. That was 2002, less than a year after the death of my grandmother. She was the first to be born in America, although she was as (southern) Italian in spirit and temperament as they come. Despite having other heritage mixed into our family, Italian always ruled, especially on the dinner table. Never underestimate the power and influence of a nonna. So there I was, standing in the village of my great-great-grandfather, the one he had left in the early 1900s for a “better life” although truth be told he traded the back-breaking work of a peasant farmer for that of a coal miner; either way he was digging himself an early grave largely for the benefit of someone else. I’ve often wondered whether he regretted changing his scenery from the brilliant Calabrian sun to the deepest, darkest depths of the earth, but as far as I know, he didn’t – or at least no one ever asked. And yet just a few generations later, I was back in his town, feeling nothing but calm and goodness and warmth wrap around me – as if my ancestors had huddled around me, just like those houses on the hillside, and welcomed me home. I have been fascinated by family history from the time I would stay up way past my bedtime, eyes at half-mast and head resting on my crossed arms on the kitchen table, absorbing my grandmother and great-aunt’s re-telling of stories of the generations that had been born in Italy. The desire to connect only grew over the years as I compiled family trees and meticulously recorded birth, marriage, and death dates. But documents are cold, and I needed the warm touch of my roots – in person. Indeed, just a few days into that first visit to Calabria, I knew I had to move there and live as my family once had (albeit with Internet and some modern conveniences). My plan was solidified when I discovered I was eligible for Italian citizenship as our blood line had never been broken according to Italian law. After more document collection and many phone calls to the Italian Consulate in Philadelphia, I proudly reclaimed something my family didn’t even know it was entitled to and now hold all the privileges and responsibilities of an Italian citizen. In August 2003, I set off, making the return journey Papù never did. The original plan was a year, maybe two, but now eight years on, I can’t imagine leaving this place behind for anywhere else. My soul has found its home. A year and a half into my Calabrian experiment, I met and fell in love with my husband Paolo, a true paesano as his family and mine are from the same small quartiere in our village (and it’s where we now live). He’s introduced me to so much I didn’t even know I was looking for when I set off to learn more about my heritage. We keep a garden, raise goats and chickens, and this past February we made our own sausage, pancetta, capocollo, supressata, and guanciale from a pig we had raised. Wine-making will come in due time (pian piano, slowly, as the Italians say), but for now, our proudest accomplishment is our little piece of land with olive trees – and our own olive oil. Whenever I walk through our grove, returning the smiles of the leaves flickering in the sunshine, I wonder what Papù would think. Were these the same olive trees he took care of for the Baron but couldn’t dream of ever owning? Could he have imagined that one day his granddaughter’s granddaughter would even have the choice to return and reclaim his family’s heritage? For the better part of a decade, I’ve gradually entrenched myself in an old-fashioned way of life that has been re-branded as “homesteading” and is all the rage in the United States. But here, eating organically, locally, and in-season aren’t trendy fads but a lifestyle that’s been around for centuries – most of what we consume that we don’t grow or raise ourselves comes from local farmers and butchers, who are the familiar, smiling faces at the weekly outdoor market. Indeed, one of my favorite aspects of living here is that Calabrian life revolves entirely around being in tune with nature. Even if I didn’t have a calendar handy, I’d know the time of year by village’s activities, whether it’s vendemmia (grape harvest) in September, olive-picking in November, sausage-making in January and February, or brush clearing and burning off in May and early June. Through this intimate relationship with the world around me, I’ve come to savor the simplicity of it all and realized just how little we truly *need* to survive. With the help of Thich Nhat Hanh’s The Miracle of Mindfulness, I have come to identify and name this desire to appreciate and be present in each moment: mindfulness. It’s a wonderful thing. This move has been the greatest gift I’ve ever given myself. My journey to discover my roots has helped me better understand where I come from, but it also continues to shape me into the person I was meant to be. It has re-rooted me in this terra that I couldn’t love any more had I been born here. Though I’ve come up our winding hill hundreds of times, I’m still to this day struck by the vision of the village around the random bend in the road – I can never remember exactly which “S” it is, and I hope I never do; I like to think that such small mysteries, along with thousands of still-hidden secret pleasures, keeps my relationship with this ancient place alive. I’ll also never know whether Papù regretted his decision to go to America, but I love that just in case he did, I’ve replanted a small part of him back here. I like to think this would make him proud, and in fact, I often feel him, his wife, his daughter (my great-grandmother), and other ancestors envelop me in warmth, just as I did that first day in the piazza – but never more strongly than when I’m among the olive trees in our campagna, drinking in their dancing, shimmering smiles. Yes, I am home, and I’m smiling right back at them. This is cross-posted at Goodlife Zen. Thanks so much to Mary for the opportunity to appear at her lovely site!